Smart recruit from France, and won on yard debut in a first time Grade Two, so clearly well-thought of. Was badly affected by the equine flu saga, and connections were struggling to get a race into him before Cheltenham. His speed came to the fore in the Dovecote, but it was not enough on good ground at Kempton, and he was always in trouble early on in the Supreme, where he made some late progress to finish seventh. Worth to do on that basis. One start for Martin Smith over obstacles - where he ran out the 11/8f winner in a Class Four maiden at Fakenham, where he was clearly in a different league. Has Grade One form from last year's Champion Bumper, and has a man on board who has had many a-day to look back on at Aintree. Finished a never-nearer second on climb up to a Class Two Handicap last time at Uttoxeter. Successful at Taunton in February after finishing in the places at Southwell and at Newbury, and poses good form with top novices Mister Fisher and Rouge Vif. Needs to find at least a stone at the handicap to play a part of this though, and it looks unlikely. Classy 6yo, who's two finishes in Class One's have merited fourth-place finishes. After a eye-catching triumph at Huntingdon, he could only manage fourth to Champ in the Challow Novices at Newbury. 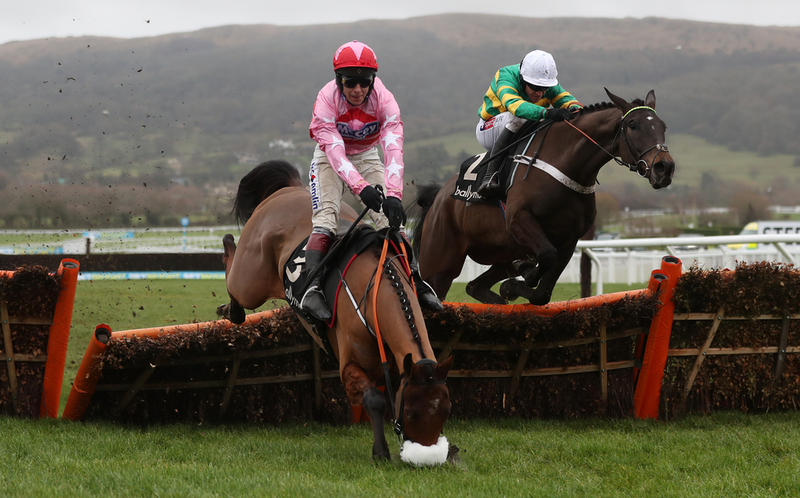 However more can be said about his same-place finish in the Ballymore Hurdle - two months after falling at the last in a trial, when rallying on late in the day to finish a few lengths behind City Island and Champ .. and Bright Forecast who stole third from him towards the finish. Consistent runs; looks a big player in this. Won three of his last four (only raced five times in career) - three of which for Gordon Elliott, and won a Grade Two last time out. Landed a point race so we know he stays; he has come a long way in a short space of time, and perhaps he is not done with just yet. Won his bumper at Newton Abbot last May before winning on hurdles debut at the same track in October just gone. Maiden jump into a Class One did not see him get involved at Cheltenham, so dropped back in class again to finish second and first at Bangor and Ffos Las latest respectively. Appears to act better on soft ground, so will be hoping for a bit of cut in the surface come Saturday. Lightly raced gelding, who did not handle the first time step-up to a Class One, when well behind Mister Fisher and Bright Forecast in a Supreme Trial. Bounced back with a smart victory at Hereford to rejig the confidence, and it was extremely comfortable, so worth another go at the top level. As for punting, probably best watched. Three runs over hurdles - two seconds and a win at Huntingdon in March. Was a good second last time to Harambe at Kempton who has come out and won again since. Hard to see him silencing this whole field, but would have a sniff at a place at best. A campaign that started so brightly for Getaway Trump has certainly dwindled off in recent weeks; only managing a fourth-placed finish in what looked a fairly weak Grade Two last time out at Kelso. He chose to skip the Cheltenham Festival too after his fourth in the Betfair Hurdle, where he saved his best work till last but was never going to trouble the runaway winner Al Dancer. Wins at Exeter and Plumpton this year, and will bid to get back on the winning trail. Bumper winner at Carlisle back in November, and not completely reached his potential over hurdles just yet. Only two attempts over timber - finished five lengths down on subsequent Tolworth winner Elixir Du Nutz on debut at Cheltenham indicated progress is down the line, but he only beat one home in the Dovecote, in form that has since not worked out. Must up his game here, win looks remote. Promising start to the season has capitulated since racing at the top level. The eye was certainly drawn to his performance at Chepstow on hurdles debut despite operating an awkward head carriage, and appeared to rub off his greenness when landing a Class Three Novice next time out at Newbury. Could not keep tabs at the same venue with Champ in the Challow but third was still a good effort, before a below par seventh in a first time three-miler at Haydock when never in contention. Drops in trip back to two-and-a-half which is a plus, and his second here last year in the Grade Two bumper surely gives him a shout. Operating in the colours of Paul & Clare Rooney, this 6yo son of Getaway - and a half brother to the useful Air Horse One who won a couple of nice races, arrives here in good shape after the closest of finishes in a Grade Three at Sandown. You may recall that contest as it was the race where the outcome of the race was mixed up with different finishing posts, but One For Rosie was rightfully awarded second place. Nevertheless it was an almighty run under 11st 12lb, and connections go over the same trip to see if he can back-up that effort. The Ruckers also have Quoi De Neuf [Esprit Du Large] who made a nice debut at this venue back in November. Only been seen once, where he finished a distant fourth in a Grade Two Ballymore trial at Sandown in December, but had excuses in terms of the ground. Will get a better surface here, and is certainly a potential improver. Colin Tizzard has had a good record at this meeting in recent years, and will let the exciting Reserve Tank strut his stuff around Liverpool. Hopefully, he will have plenty of 'reserves in the tank', having raced just two weeks ago at Kempton, where he won by a neck over Nicky Henderson's The Cashel Man in a Class Four novice. He certainly was a talking point after his victory at Sandown got the better of odds-on fancy Elusive Belle, and merits this jump up in class. Has to go into the selection pot. Arrives with plenty to prove, having shown an excellent turn of foot at the start of the season, but not been in the same light since. Victories at Haydock and Chepstow really showed him off to be a real star, but he failed to continue his momentum when finishing a below-par fourth at Kempton on Boxing Day - finishing behind Rouge Vif. He had a break before his clash in the Supreme, and was last but one to finish after a few heavy mistakes. A good deal to demonstrate. Struck the hat-trick with a win in a Novice at Exeter in February and looked rather impressive. That followed up his only other win over obstacles when he was successful under Tom Scudamore in a maiden at Southwell, three weeks after prevailing in his maiden bumper. Can handle all sorts of ground, and has to go into calculations away from the market principles.